“Sebi had mandated the disclosure of commissions in a circular a few years ago (2009, when it had abolished entry loads). Distributors are supposed to tell their clients how much commission each fund pays. The current disclosures will not matter for certain customers who are aware of commissions or who are comfortable with the distributor they have. For others, the thought will go towards value addition by the distributor, and if that is missing, then alternate channels could be sought out," said Rajesh Krishnamoorthy, managing director, iFast Financial India, the firm that runs Fundsupermart.com. Understandably, the distributor community is not happy. Some say that disclosure of commissions could lead to passbacks. The practice of passback of commissions—whereby a distributor gives a part of her commissions earned from MFs to the investor—is banned, but is said be happening in a section of distributors. Some say that this might now increase. “For first-time investors in equity funds, seeing a negative return along with the positive commission expense may not go down well," said the chief executive officer of a small-sized fund house who did not wish to be named. He adds that bank-based distributors may escape the intent of this disclosure, even if their commissions levels are unrealistic to the value of advice they give, and that smaller distributors will be the only ones who will “bear the brunt". On the other hand, financial advisers, especially those registered with Sebi, are happy with the increased transparency. “We started our business by disclosing commissions and letting the client know about various costs. So, most of our clients, whether on a fee-based service or otherwise, are aware of the commissions," said Varun Girilal, co-founder and executive director, Mitraz Financial Services Pvt. Ltd. He also said that it is wrong to say that investing, even through online robo advisory channels, is free. “There is an embedded cost and clients should be made aware at the start to reduce conflict of interest," he said. Such disclosures not only increase transparency, it is beneficial for the investor. “However, especially for first-time investors, there may be a need to educate them about non-linear returns in asset classes like equity. It can take some time for the investment to show the desired result," said Vishal Dhawan, founder and chief executive officer, Plan Ahead Wealth Advisors. He said that this information should be made available in the account statement so that the link can be established between the product, expenses and returns. Your CAS will also have information on the expense ratio of both the direct plan and regular plan of a scheme you have invested in. However, many feel this is futile. And they say this could actually hurt distributors and investors in falling markets. “In falling markets, the investor will see red in her portfolio, and she will also see the commission paid to the distributor. It would be natural for her to have thoughts like: When my money is eroding, why is my intermediary still being paid? The intermediary has to do a lot of work, especially in market down cycle because that is where the hand-holding helps. I fear that investors might not be able to see beyond short-term paper loss and might end up sacrificing long-term growth potential," said Amol Joshi is founder, PlanRupee Investment Services. Others question how this will benefit the industry and investors. 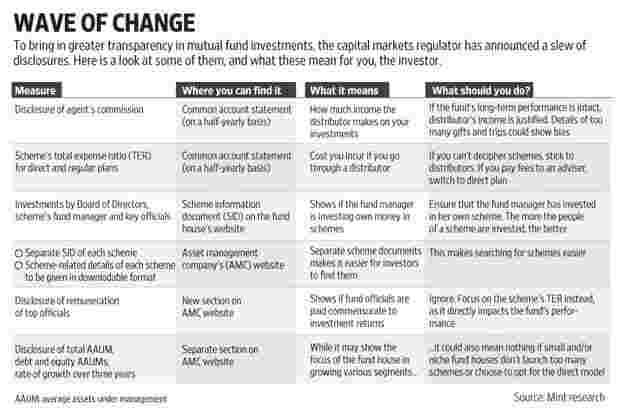 “Is this disclosure going to increase penetration of mutual funds? How does it protect investors?" asked Roopa Venkatakrishnan, a Mumbai-based MF distributor. It’s not just your distributor’s income that Sebi wants you to know. Effective 1 April 2016,your fund house will also now be required to disclose salaries of all its fund managers, its chief executive officer (CEO) and all senior employees whose salaries are in excess of 60 lakh per annum. These disclosures will need to be made prominently on a fund house’s website. But now salaries of any one who earns more than 60 lakh a year (not just key officials) will have be disclosed. Besides, the disclosures can no longer be hidden in a company’s annual reports. They will have to be displayed in a separate section on the fund house’s website. Here too, a large section of the industry did not approve of the move. “The expense ratio that the scheme charges is regulated and capped by Sebi. Anything beyond that is anyway absorbed by the fund house and shareholders. An additional disclosure of the break up of total expense ratio may not add value to investors," said Sundeep Sikka, chief executive officer, Reliance Capital Asset Management Ltd.
“This is a step in the right direction. Salaries of senior officials are already listed in the annual reports. All Sebi has done is widened the ambit of such officials a bit," said Akshay Gupta, chief executive officer, Indiabulls Asset Management Co. Ltd. Gupta also cautions that if such disclosures if made for only one financial instrument (in this case mutual funds) and not for others such as insurance, it can create a distortion. Jimmy Patel, chief executive officer, Quantum Asset Management Co. Pvt. Ltd, made an interesting point. “Disclosing staff remuneration can be seen as an element of cost and in any case is required by company law, but has human resources issues. However, the focus needs to be on functions and cost rather than only on people. For example, it’s good if a fund house is spending on research and investment staff as that is the core business. This could be contrasted with the marketing function staff spends, to see where the focus of the asset manager lies," he said. In February 2014, Sebi had said that all fund houses were required to put in 1% of their own money, called seed capital, subject to a maximum of 50 lakh, in all their open-ended mutual fund schemes. Existing and new funds were asked to comply. In May 2013 when PPFAS Asset Management Pvt. Ltd launched its first (and till date its only MF scheme) equity fund, PPFAS Long Term Value Fund, it publicly disclosed that all its senior employees would invest in the scheme. As on the end of February 2016, 12.46% of the scheme’s corpus (596 crore) or close to 75 crore belong to the employees of the firm. “There is no guarantee that an investment will work out for unitholders. However, when the managers of the fund and key personnel invest in the scheme it aligns the interests. It helps in avoiding excesses like launching sectoral funds at peaks. It forces the attention of the fund house to the task of managing of investments rather than just asset gathering," said Rajeev Thakkar, chief investment officer and director, PPFAS Asset Management Pvt. Ltd.